11/08/2010 Update: AdoramaPix calendars and 8×8 photo books are 20% off! (through 11/22/2010). This is one in a series of posts reviewing the available options for making your own wedding photo album. If you’re a bride or groom, you won’t want to miss my multi-part bride-to-bride (or bride-to-groom) guide on wedding photography and DIY photo books. At the bottom of this post will be any current AdoramaPix deals, or click on the link to see the latest AdoramaPix promo codes! Until recently, I’d never made a lay flat photo book before. I wrote about the photo book options I hadn’t tried yet in a prior post and this was one of the top features I was most interested in exploring. Enter AdoramaPix. I was offered a complimentary photo book to try out their software and it was the perfect opportunity to try out a lay flat wedding photo book. This is a DIY option that many brides and grooms are seeking to get a “professional looking” photo book at an affordable price. AdoramaPix’s software runs off their site. You start by choosing the shape for your book. 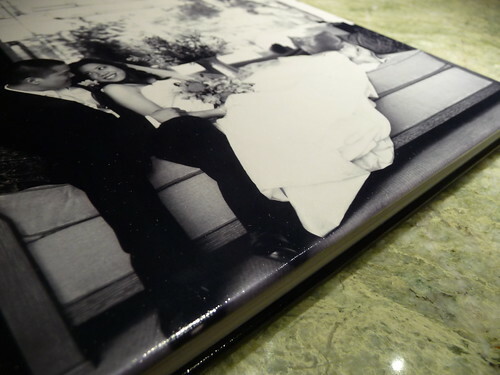 The company offers portrait, square and landscape books in a number of sizes. The largest would be the 12×12 and the smallest is a 6×4 portrait sized book. For my book I selected the portrait 10×8 Santa Fe book. As the book opens for a full spread of 16 inches across and 10 inches high, the ratio seemed right for featuring full bleed two-page spreads with minimal loss of image due to cropping. Since I was making a wedding photo album, I thought about the ones I had seen online and many of them were vertical in orientation, plus since most of my photo books are landscape books, I wanted this book to stand out. You can pick from portrait, square or landscape books. Next you choose the number of pages for your book. 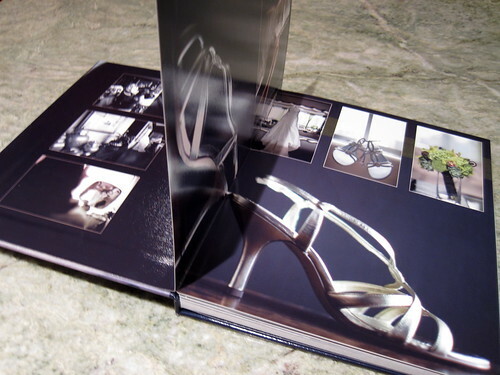 AdoramaPix books come in fixed page counts: 14, 26, 38, 50 and 76. These fixed page increments are necessary to accommodate the book’s unique lay flat accordion-type binding. If you find that your book is longer or shorter than you thought, you can change the page count easily while you’re building the book, so no worries. My book featured 160 of my favorite wedding photos taken by our talented photographer Albert Yau of Second Print Productions and a few taken by family and friends. Choosing a page count. You can change this later. The next step is to choose a theme. There are more than 30 of them to select from ranging from baby books, wedding, and guest books to graduating seniors books. For mine, I chose “Build your own” for a blank slate. You can choose from more than 30 themes. You can start from a theme and then customize it, or start with a blank canvas. Next you have to upload your photos. If you have them already uploaded to Flickr or Picasa, you can select those options. The workspace for the book itself is kind of small, but you can zoom in and out with a slider tool. Note that the green shaded areas of the layout may be cut off in the trimming process. The cover has a larger potential area that may be lost in the final printed book than with the interior pages. Avoid putting in the green area any captions or part of the photo which you would not want to be trimmed off. A screenshot of the main workspace. The green shaded area may potentially be trimmed off. You simply drag and drop the photos you wish to use. If you’ve used a template, it’s very easy to build your book. You can also choose the autofill function to place your photos and tweak from there. Creating your own layouts is not difficult either. The layouts are fully customizable, so you can use your full creative power to make any design from scratch, or alter any provided theme to suit your needs. The green "ribbon" is a sticker embellishment, one of many available in the program. When you right click on the Mac, a window pops up to copy the spread. Then you can click at the bottom where the page spreads are visible, to paste the copied spread. 12) I like the book copy function which allows you to make a complete duplicate of your book. (accessible when you’re outside the software and viewing your projects under “My Books”) That way, you can mess with a new version while keeping the original version untouched. 4) There aren’t extensive editing tools for your photos if you want to fix contrast or brightness etc. You need to do that in an outside program. It would be nice to be able to do minor tweaks while working within the book making software. 1) The book is printed on actual photo paper – Fuji Crystal Archive photo paper to be exact, not regular paper so the print quality is excellent. Since it’s printed on photo paper, it should come closest to the original photo. I'm not holding up this page - it's so sturdy, it stands up by itself! 3) The pages lay flat and have no gutter which means you will not lose any of the image in the center of the book. No worrying about how a two-page spread will come out. You can see here the spreads are made up of a single page folded in the center which results in no image loss. A spread showing my DIY centerpieces and photo table numbers. 4) Note that the first page opens up to the first spread and the last page of the book features the last spread. This is where you may see an outline of how the pages are attached to the cover. It didn’t bother me and didn’t affect the quality of my photos, but , if you’re concerned you could design a “filler page” for the front and back of just a plain background and not place any photos on it. The inside cover contains the first spread of the book. 5) The cover surprisingly looks like metallic paper was used. The specs noted that the paper would be coated with a durable scuff resistant pearl-gloss finish, though there appeared to be some tiny air bubbles on the surface of the cover only (not on the interior) that did not “cure” perhaps? The black and white photos printed with a nice sheen to them. I happened to use metallic photo paper when I printed my photo table numbers for my wedding and for a 5×7 print I framed of this exact photo. I like how it makes the images pop – if this isn’t actually printed on metallic paper, it looks to have the same effect. The front cover of me and the hubs. The back cover of my book. Like our balloons? Note that I opted for the protective coating on all the pages. I don’t know what the book would look like without it, but I wanted the pages to be durable. 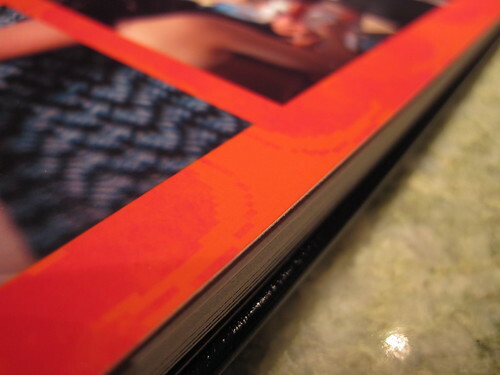 The coating adds a reflective luster to the pages, which you may or may not like – I think it came out nicely here. Also, I did not go with the auto-correction for my photos. They came fully edited from my photographer and I already had them the way I wanted them. Lastly, there is no logo in AdoramaPix books, a point that is crucial for some, not any concern to others. I prefer no logo if I have the option, but if I don’t, it doesn’t bother me as I’m not reselling my books. A comparison of AdoramaPix vs Mpix pricing and specs for a similar photo book. I’ve never printed one of Mpix’s Assembled Albums before so I can’t do a quality comparison for you. I have only printed prints with them and one small 5×5 press photo book (which is different from the assembled albums). 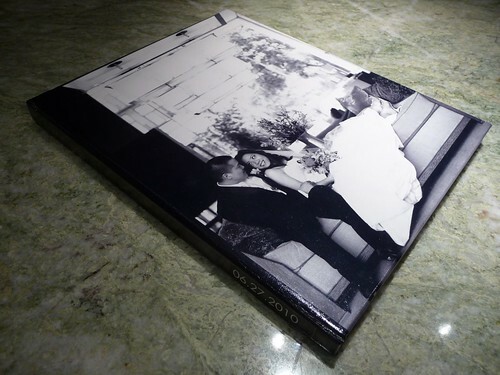 Overall, AdoramaPix was ideal for making an affordable high quality wedding photo book with sturdy lay-flat pages printed on real photo paper. I would highly recommend brides (and non-brides for that matter) to try out AdoramaPix. I was really pleased with how my book turned out and looking forward to making more books with them! Currently, AdoramaPix is offering $10 off to all new customers. You can click on the link below to check it out for yourself! If any sales or promos pop up, I’ll be sure to let you know. Click here for the latest AdoramaPix deals. You can also try AdoramaPix for getting prints, cameras and other photography equipment. The best way to stay on top of photo book deals is to fan my page on Facebook! Looks amazing. I hope I get to see it one day. thank you for a great in-depth review. i can’t wait to try adorama out! If you tell it to “fit image to page” your image will be zoomed in and fit in…with no further option to zoom out. Thus, your original image will be cut/cropped without you wanting it that way. If you want it to fit the whole page then yes, you may lose some of your image. Choosing a book size that matches best with the orientation of your photos will work best. For my photo book, I chose the 8×10 portrait size (known as the 10×8 “Santa Fe” book on the AdoramaPix site). When you open it, you get 16 inches across and 10 inches down which is very similar in ratio to the original photos. I planned for my layouts to mostly contain my photos as background to the entire two page spread so the 8×10 worked best as you can see from the images I posted. Therefore using this size, resulted in minimal loss for my “fit to spread” photos. You can still have a photo stretch across both pages (but not fully filling the spread) and not lose any of the image – just put some type of background you want behind it. I choose neutral backgrounds like black or grey for a clean look. Thanks for the reply. Do you know if there is a way for me to resize the pics to fit the book so they wont automatically get cropped?…without loosing picture quality? Thanks! What are the size of your pics and what size book are you trying to do? Are you talking about when you’re using AdoramaPix? Great review! Thanks for the time you spent working on this! I think the reviews take longer to put together than the books themselves! Thanks for your comment – glad you liked it! Wow, thank you for the in-depth review! I am so glad I found this blog, I’ve been scouring the Internet for a place to order a quality photobook of my wedding without being a professional photog. I just got married in July, and am so excited to check out AdoramaPix! Your album looks beautiful, BTW! Thank you so much for the review. I have a question, I am in the process of making my wedding photobook. If you can compare the Picaboo (madison layflat photobook) and Adorama (layflat photobook, which one will be your first choice. I appreciate the respond. Thank you! 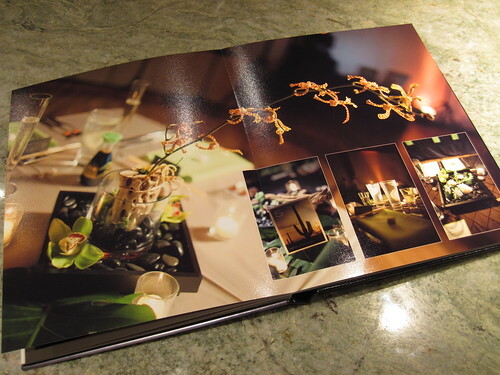 1) First off, I’m assuming you want hardcover for a nice professional looking wedding album – both companies offer that. 2) Do you want a portrait book like mine or do you prefer landscape? Picaboo only has landscape books, while AdoramaPix has both. 3) Does cover matter to you? I know some brides want to have a leather cover – Picaboo has that, but AdoramaPix doesn’t. I personally prefer a full photo custom cover, which both companies have. 4) As for paper, the AdoramaPix “stiff” photo paper pages are very different from the Picaboo Madison 110 lb. card stock pearlescent paper. The former is real photo paper, the latter is also stiffer than other photo books you may have seen. It gives off a pearl sheen or metallic reflection on the pages. This is a matter of personal preference. 5) As for software, I really like the “Fit to Spread” function offered in AdoramaPix – for a lay flat book, you’ll want to have an easy way to have a single photo span both pages. Picaboo doesn’t have that automatic function – you can do it, but have to do it by hand. Picaboo doesn’t have an alignment tool either which is essential if you’re making custom layouts. If you’re going to use the templates they provide however, it doesn’t matter as much. 6) As for price, you should check out our Photo Book Wizard tool. This tool will help you narrow down a company that has the key specs you’re looking for as well as allow you to compare the cost of their books depending on how many pages you plan to have. As you can see from the chart below, the Picaboo Madison is twice the price of a comparable AdoramaPix book. The Picaboo book does offer a presentation box and leather casing however, so that accounts for some of the price. So, your choice will naturally also depend on your budget. If you find that you like Picaboo however, you should look out for Picaboo Groupons which can save you big bucks! (I try to stay on top of that and search for the cities that are offering them – so check my site often or Fan my Facebook Page). I have a link for AdoramaPix in this post. I hope that helps you narrow down your decision. If you’re interested to know, in an unofficial survey of three of my friends who saw both books, two of them liked the AdoramaPix book more and one of them liked the Picaboo book more. So, whatever that’s worth! 🙂 If you take into consideration the factors I’ve outlined above, I’m sure you’ll be happy with either choice. Let me know if you have more specific questions! What a great review! I got married a few months ago and was looking into using MPix to make a professional looking photobook for the parents…but making templates completely from scratch was something I don’t have time for. I’m so glad I stumbled on your Adoramapix review! Their web-based software for designing the book is just what I needed. I do have one question… Adoramapix states that their “bleed” margin (area where image loss may occur) on each page is about 1/4″. One person commented on their site that the bleed area is more like 1/2″. What did you find with your photobook? Closer to 1/4″ or 1/2″? Congrats on your marriage! I’m glad you like my review. I found that the preview was very, very accurate in displaying what printed out in the book. The interior pages, were almost exactly what I saw in the preview (I looked at all of the pages in my book and then compared it to the book in the preview and in the editing mode and found that there was very little if any image loss). I would say maybe 1/8″ if that. The cover had a little more image loss (due to the wrapping). I would say that the cover image loss was about a 1/4″. I think the real image loss would occur if you want a full page bleed on a landscape book (mine was portrait). I discuss that briefly in this post about my experience in making a portrait oriented photo book. I also did a Q&A recently on a similar question on aspect ratios. Hope you have fun designing your book! Please come back to comment if you’d like to share how it came out! Hi there! Amazing review! Won me over for Adoramapix, hands down! A question for you, however, as I am new to the world of photobooks. 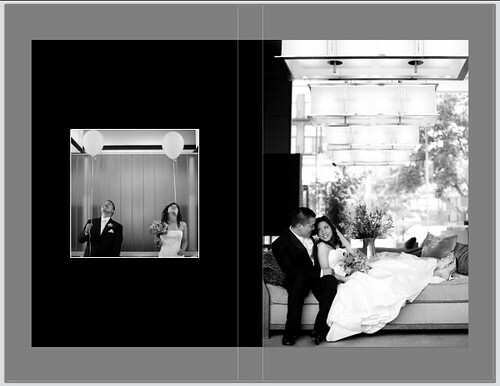 I’m attempting to create my wedding book and I’m curious how in the Adoramapix program you can select photos to lay on top of a photo used as a spread – much like your book page of your ceremony with the six smaller photos positioned over top of the two page spread photo. I have my “spread” shot inserted but every time I try to insert another photo on top, it just becomes the new “spread” shot. 3) You can then drag and drop a photo in there. If you want those boxes to be the same size, after you adjust the first box, just select the box by clicking on it and then right click and choose copy. Then paste and you have easily duplicated your box and no need to worry if they are the same size cause it’s an exact duplicate. Hope that helps! I got my wedding photobook today, using the 25% off 8×10 landscape promotion and $10 credit. The book is definately feels and look better than the photobooks available elsewhere. The layflat pages make the 2page spreads looks really good, and I can’t stop looking at them again and again. The SW make it easy to arrange the pictures, and I only have to spend more effort on selected pages. The pages comes out a little darker than expected, but that may due to the UV coating, and the black background. I am looking at making at making a portrait book with them next time. Thanks for your reply to my earlier post. Hopefully the bleed margin will not be too big on my photobook either. It’s nearly finished now, just needs a few touch ups and it’ll be ready to go! I do have another question. For the front cover photo, I have a single photo taking up the entire cover. The areas that are grayed out (top, bottom, and right) I assume will be the part that wraps around the edges before being glued to the inside of the cover. If my photograph is within the non-gray zone, will all of that be preserved on the front cover, or will some of it be wrapped around the edges? I’m not sure if this is something you noted on your photobook – but if you did, please let me know! I think the best way for me to clarify is just to show you, so I did a screenshot of the cover. I didn’t use a single photo to cross the entire cover as you have, but this should give you a good idea when I say about 1/4″ was cut off from what I saw. Yes, the image wraps around the edge into the inside of the cover, so part of your image even if it’s not in the gray zone will be wrapped around the edge. Great review. I like the Adoramapix books but my wife LOVES them. We have a bunch around the house with another three on the way. An 8×10 as a 1st Anniversary present and then two smaller ones as Christmas gifts for our parents. The other cool thing I liked about making a duplicate book is that it only gives you the sizes which scale correctly. No jacked up books when you try to fit your 8×10 design into a 5×7 book. Thanks for your comment! b/t/w hope you’ll check out my Facebook Fan page and stay in touch! Just wanted to give you an update on my book – I have completed it and received it in the mail today. I wanted so much to love the book, and I would have, EXCEPT that all the photos were so dark that they appeared underexposed, in contrast to how they appeared online. And yes, they were originally edited by my photographer, who has been doing this for 16 years. The only reason for the dark photos that I can put my finger on is that I did NOT choose the color correct option. Apparently the color correction has less to do with aesthetic photo correction by the techs and more with converting the color profile of my photo files to Adorama’s printer profile. I’m hoping that ordering a second book with color correction will fix the problem. However, I find it interesting that your book turned out just fine without Adorama’s color correction, which makes me less sure that allowing them to color correct will be the answer. I’ve sent them an email about this issue, hoping they can work something out with me about ordering a second book, since these books are not cheap. Love your wedding photobook!! I am hoping to make one in the future from my 1,000+ wedding pictures. Again thanks for sharing your personal pictures and ideas with us. Great review! I agree with the needing more font choices. I used them to make our photo guestbook and that was one of my larger problems. Wonderful review! I agree that the pages are so nice and thick. I would like to try the protective coating sometime, since I did not go with that option on my last purchase from AdoramaPix. This book is with the coating. I have only printed one book with them and these photos are of the pages with the coating. An update on my “dark” prints: So I ended up showing my book to one of my photographer friends, and I tried looking at it different kinds of lighting. My friend seemed to think the way the photos turned out was fine. He also made a good point – my computer monitor is illuminated, so the photos will naturally appear darker on paper. Seems obvious, but in yellow indoor lighting, the photos can appear quite a bit darker. In bright sunlight or fluorescent light, they look the way they do on my monitor. My husband thinks I have been staring at the photos on the monitor too much in designing this book. My perfectionist tendencies coming through, I guess! I did email Adoramapix in the beginning, and they offered me a return and full refund. But after evaluating the above, I decided to order another book with color correction this time. (I will be ordering several books eventually for family anyway, so why not?) To be honest, there wasn’t any noticeable difference between color corrected vs not. I don’t often order photo prints, so I guess I was a little caught by surprise by something that is normal (prints appearing darker than on monitor, that is). Overall, though, I am very pleased with the book, and with Adoramapix’s customer service. The print quality is excellent, and the colors are very rich. And I love the metallic paper on the cover! I really can’t complain. Once again, I’m very glad I found your review, because now our parents can have really nice photobooks, and we can even gift smaller versions to our relatives. So thank you for your review, and thanks for all your help in answering my questions! I really like that adoramapix uses real photo paper. It does have a texture to it, and they don’t use any other kind of paper. 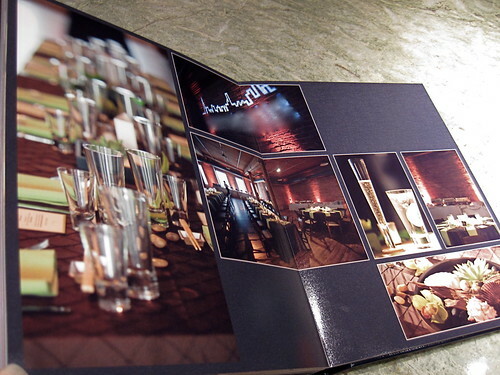 Have you found any other companies using real photo paper that are reasonably priced? Thanks so much for this extensive review! I am currently working on my engagement book, and was wondering which frame you used for your wedding album? It is thin white or medium? I dont want it too thick, and the size you used seems perfect. Hi Pinkie – I had to go back into the program to check. I had some at “2, “3”, “5”, and “7”, so I think if you go no more than a 7 in width, you should be fine. The very top photo in the post I used a “7” border size. The one with my DIY centerpieces was a “3”. The inside cover with me in the mirror had borders of “2”. I was actually surprised I had different border sizes. It would probably be easier to choose a number you like and stick to that throughout the whole book as you can see, they are all pretty thin. Hope that helps! great revview, thanks for posting it! I’ve used MyPublisher several times, and I’ve been very happy with the photographic quality of the pages, and especially the leather covers.. How would you say the quality of these Adoramapix books compare to MyPublisher? I’m very tempted to jump ship just for the layflat pages as I often use two page spreads, and you DO lose a little in the gutter..
you’re quite right,I’ll just have to bite the bullet and give it a try for myself..
It’s a shame about the fixed amount of pages with Adoramapix, if you don’t fill them up you just get a load of blank pages at the back? weird.. My weddings are usually between 30-50 pages long, so it’s call for some CAREFUL planning.. 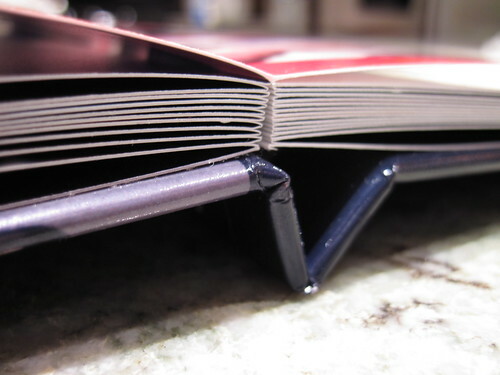 Yes, it’s because of the unique binding and the folding, accordion-type pages that allow there to be no gutter. So, it’s a trade off. I seem to have no trouble filling extra pages! ha ha… Look forward to hearing back from you about your experience! Yes, been a little absent from Flickr lately, but planning to get back over there soon! I’m on my Facebook page all the time so if you’re not there, please consider fanning the page. Thanks for commenting! Hope you’ll post another comment to give your thoughts on your experience! Best! Thank you so much for all of your wonderful reviews! Your website has been a big help for us in making our parents albums. We love the idea of a layflat album, but I noticed that adoramapix no longer offers the UV coating option on their photobooks (It’s not an option on the checkout page, and when I emailed adorama to ask about it they said it’s no longer offered). Do you think that would make a big difference in the page quality? Should we still order from them? Thanks for your help! Since I only have the one book with the coating, I can’t give you a firsthand opinion. When I had asked in the past if the coating gave the pages a different finish, the company said that it would look the same either way. If you see the part of my review where I talk about tiny air “bubbles” – I thought that may be caused by the coating drying unevenly. It did add a considerable cost to the book from what I recall (they later raised the price for it). I can’t say for sure, which I would prefer because I haven’t tried it, but the lack of UV coating wouldn’t keep me from ordering from them again. Awesomeness, thanks alot for doing this. Question, does it come in box like MyPhotoCreations? I decided to buy our albums from AdoramaPix after reading this review. I’ve received one of them so far and I’m pretty happy with the quality. I don’t care for the shiny metallic cover since I’m very fair skinned and it made me look like a ghost. But the rest was great! I recently ordered a book from smilebooks and was highly dissappointed by the customer service. I WOULD NOT recommend the Smilebooks company. The software is a little better than Adoramapix but Adoramapix far surpasses the quality of Smilebooks. I will continue using all the helpful advice on this site and highly recommend Adoramapix!! Hey up pbg, I just wanted to say thanks for all the time and effort you’ve put into these here reviews, it’s proving itself to be a very valuable resource for us mere mortals in internetland. After reading your bogs I opted finally for Adoramapix instead of MyPublisher (my usual choice) and I wasn’t disappointed. There really is no comparison, the thickness of pages, quality of print, lack of gutter all add up to shove Adoramapix up into a class above MyPublisher. The only negatives I had were that they don’t do leather covers, and you have to make a book to their specific preset numbers of pages (more difficult than I imagined!) but BOTH of these features are apparently being addressed at the moment and we can expect to see them soon! YAY! The other thing is the cost, at probably twice the cost of MyPublisher for a rough equivalent, it IS expensive, but it’s not really a fair comparison as it IS a class above. Ya gets what ya pays fer. AND here in the UK, I had to pay a £34.00 VAT charge and handling fee. Never had that before with MyPublisher, but maybe the govt’s just tightening up, times are hard y’know. Having read your recent review of MyPublisher’s layflat pages, I’m slightly disappointed that they aren’t COMPLETELY gutterless, but for the price difference I’ll rearrange my pages so nothing vital is on the gutter. I think I’ll be ordering four of the same books with the latest wedding so I’ll definitely be using MP for their vouchers! Anyways, thanks for all your work, just wanted to let you know it’s appreciated, and please keep ’em coming! I’ve found picking a site to make my wedding album to be very stressful. There are just too many options! My sister in law recommended I check out your blog as I was pretty sure I wanted a lay flat album. Thanks so much for all of the detail you provided with your wedding album. You’ve sold me on AdoramaPix and taken some of the post-wedding stress off my shoulders! This blog entry has proven invaluable as I have been creating my own Adorama wedding album; I enjoyed your youtube to demonstrate the quality of the pages, and I especially like your style of fitting one photo to the entire spread and then layering smaller photos on top. You have inspired me! A few questions: When I order, does Adorama print on a variety of photo papers (glossy, luster, matte finish) or is there no option? Also, did you find that any of your photos were cut off (even slightly) that were up to the edge on pages? I’m wondering if I should be sure to leave a little margin for loss of the image in printing. Adorama only has one paper choice – the UV coating is no longer offered, but I was told by AdoramaPix that it doesn’t change the appearance of the paper. I didn’t see any noticeable cut off on the interior pages, so I don’t think you should be too worried – just don’t put any captions too close to any edge which is a good rule of thumb for any photo book company you choose. If you look at the earlier comments, a reader asked about the cutoff on the cover – I’ve showed a screenshot and final for comparison there. Good luck on your book! I try to answer the questions if I can! 🙂 For #1 for this book – I haven’t found fingerprints to be an issue – however please note I did order this book when it had an optional UV coating, so my book is going to be different, but according to the company there isn’t a difference in sheen. As for journaling, since you can completely design your book from scratch, you can add as much space as you want for journaling. Hope that helps! You have INSPIRED me! I just finished making my very first photobook (Artscow), thanks to all the info on your website 🙂 I just got married a few months ago.. looking into making a wedding photobook. Your review on adoramapx has sold me.. onto book #2. One question, the sturdy/thickness of the pages on the book you made was very nice/thick (thanks for the video). Since the UV option is not available anymore, is the thickness/sturdiness of the pages still comparable? I couldn’t find the details of the weight of the photopaper on the current adoramapix website. I just purchase my very first photobook from artscow (deluxe photo book, lay flat/sturdy/thick pages). I was wondering if the books from adorama provide the same type of sturdiness. Placed order on 7/25/11, shipped on 8/4/11, arrived on 8/11/11. I ordered Deluxe Photobook 8×8. Original Price $35, but when you sign up/create an account to the ArtsCow website, you periodically get specials/deals. I happened to a deal/special for the deluxe book that I was working on, only $20 total for the deluxe book (and it included shipping from hong kong). What a deal! Only downside to doing the deluxe book from ArtsCow is that there’s only 20 pages max (standard size, no option to add additional pages). I’m glad you like my blog – thanks for commenting. I think with the change, there is a bit of loss of uniqueness on the Madison. So, if you’re looking at price, it would seem that the AdoramaPix (with the lay flat and the thick, real photo paper pages) may be a better choice. 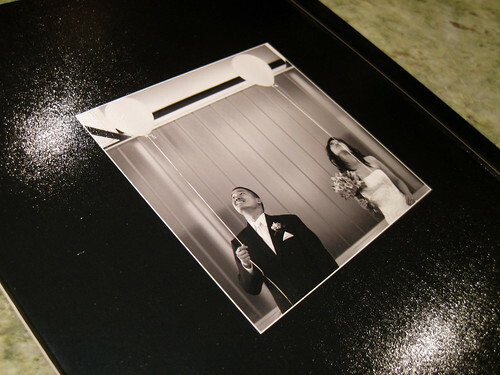 Yes, flush mount is very, very pricey, but it is very, very nice – especially for a wedding book, but I like my AdoramaPix book very much and it’s much more affordable. If you’re into flexible design I would recommend Photobook America. For lots of deals, MyPublisher always has a lot going on. If you check out my wedding photo book posts, you’ll see that I made some more expensive higher quality books to keep and then some less expensive but still nice quality books for my folks and other family. Best of luck on your book projects and congrats! b/t/w make sure to check out the deals page and Groupon page to look out for promos that will save you lots of $$$. You can’t really compare AdoramaPix’s photo paper to MyPublisher’s 182 lb. cover stock since the former is real photo paper and the latter is not. I happen to like both. I like the MyPublisher coverstock more than the super gloss – it’s just a preference. The AdoramaPix pages are thicker than the the MyPublisher, but both have very good print quality so you can’t go wrong with either. I’ve done a review on the super gloss – have you checked that out? And, I’ve done a paper comparison post (for regular paper, not specialty papers) http://www.photobookgirl.com/blog/photo-book-paper-quality-compared-photo-book-company-prints-best-paper/ If you ask me which one I’d use for my wedding books? I used both! I personally think both are affordable enough so if you take other factors: AdoramaPix has better design software in my opinion (though I haven’t tried MyPublisher’s new software yet (for the PC and I use Mac). If you need more than 76 pages (which is AP’s max) then I’d go with MyPublisher. Hope that helps. b/t/w AP has a sale on 12×12 now and Deluxe is on sale for Classic price. Sales on both! AdoramaPix hasn’t issued a Groupon so far. I would say they may have deals every 3 weeks to perhaps once a month? They aren’t as frequent as MyPublisher or any of the common Groupon companies such as Picaboo, Mixbook, Blurb or Photobook America. AdoramaPix has in the past offered prepaids – meaning you can buy a book credit at a sale price and then use it whenever with no expiration date. I haven’t seen one of those in a long while though… Best of luck on your books! Testing. Why was my comment/questions not posted? I want a square book and started one with Picaboo. Now I’m almost done but find that I can’t print one of the higher quality albums like the Madison because it’s square. It shows that it’s “coming soon” but what does that mean? Can you help me? I’ve spent so much time on this book of my son’s senior pictures. Thank you! I sometimes, but don’t always hear about that information first, so sorry, I can’t say I know about a square Madison coming soon. Perhaps if you try the chat function during business hours they can help? I do know that you can’t easily change orientation of the books with any company since layouts are so particular to the book shape. Perhaps you can upgrade the square book to lay flat pages and that will make it a little more “high-end”? ‘thank you! I HAVE decided to go with AP though. But now I can’t figure out how to put text on the pages, let alone change font, etc. Where can I find instructions? There is a “Help” button there – I just went to look at it the other day. To add text, look at the left hand side – there should be a series of tabs going down the left side vertically. Look for “Text” and then click on the Text box and drag it to where you want to add text. That should do it! Thanks for the extensive info on photo albums. No need to post just want to thank you for your in-depth devotion to the topic…and congrad’s on the new member to your family. -leather covers… do you know what the quality is like? -gold stamping on the cover for the book title & caption… is this nice? -2 types of paper: kodak lustre vs fujifilm HD high gloss. Which is better? Are both papers the same thickness? I’ll probably be doing a leather book soon, but may be about a month from now, so if you’re not in a rush, I’ll have a post about it when I do. Between the two papers, I don’t think you can say one is better than the other – I think in this case it’s a matter of preference. Another reader who did get to see the two firsthand told me the high gloss is really, really glossy and that he personally preferred the lustre. I suppose if you can remember back in the day when people printed photo prints, were you a glossy or matte person? If you were a matte person, go with the lustre. I personally prefer lustre over high gloss. Even though I haven’t seen the high gloss in person, I already know that I’d prefer matte. Though it may depend on the application or type of project. So, I hope that helps! Hi there! Any updates on the leather cover and/or gold stamping? I haven’t gotten to making the book yet, but hope to in the next couple weeks! Stay tuned! I finally got my books and can say I’m rather impressed. – The books were super easy to create. First time ever using the software, I completed a whole design while watching a Sunday NFL game. – The fact I could upload my pictures from smugmug was a HUGE bonus. Smugmug has never mentioned on their site they had a plugin with adorama but that was very time saving. – Not an Adorama dislike but a stupid move by me…I should have done a 38 page book vs. a 26 page book. I felt like I went through viewing the book way to quick with 26 pages. – I’m just use to books (ANY book) having a blank 1st page and last page. It would be a nice to have. – I hate the fact that when you order two different sizes they automatically make them both the same paper type and you can’t choose individually. This was overcome by doing a copy and adding a copy to the order but still its extra work. Another dislike I forgot to add…it seems if their “set your price” feature never worked. I set it to a price then sent out a test email. When clicking from the email to the book order it always showed the base price. I would NEVER want a customer to see the base price of a product. For now I’ll just order and deliver myself. Thanks so much for the review on Adorama Pix. I ordered a book and am very impressed by their printing quality just as you said. I do have a question that I would like to ask others who have ordered a book from AP. The cover of my book has cracks in the image where it folds open. I guess it’s because it wasn’t pre-scored. Is anyone else having this issue? Could it be just a one time problem? Yes, I have the same on my books. I don’t know if there’s a way to avoid it unfortunately – seems like it’s inherent in way it’s constructed. That’s a good point, I wonder if they could prescore it like you mention. I just wanted to thank you for your wonderful and in-depth review of all the photobook websites and software! My fiancé and I are willing to spend a reasonable amount of money on our wedding photographer, but the idea of paying $700-$1,500 for a 20-page wedding album made us choke. You have helped me so much, and have also reassured me that I CAN make a beautiful lay-flat wedding album online, and not pay an arm and a leg for it. Using the information and advice you provide in your wedding album posts, we’ll be able to not only design our own wedding album, but we’ll also be able to afford to get albums for our parents. Thanks again! I’m so glad you’ve found my site useful. I do want to say that I respect pro photographers (many of whom are my friends), and I can understand the reason for the high rates as I believe photography is an art and they should be well compensated for their time and trained eye. But I can also understand the viewpoint of the brides and grooms who just spent a boat load of money on their weddings and are trying to save where possible. Yes, you can make a beautiful album online – it just takes some time and effort, but I’m sure you’ll end up with something wonderful to remember your big day. Best! Anyway, I just made my first Adoramapix book and I love it. It’s definitely high quality. One thing I wanted to note though (and it might be helpful to add this in your article) is that the inside front and back covers no longer contain the first and last spreads of the book. They now are just blank black pages. The reason I say that you might want to add that to your article is because I almost didn’t put pictures on the first and last page spreads, since I wanted blank end pages. If I had done that, I would have had four blank pages at each end and wasted two spreads! So, you might want to make a note under #4 that the inside covers no longer contain the first and last spreads. Thanks for your message with the update on the inside covers. That was a concern for some readers who didn’t like that, so it’s good to know they made a change. I always appreciate a nice endsheet, so while I didn’t mind before, I think this is the better way to go. The last book I made was around this past December/January, so I haven’t gotten a book like yours yet. But eager to check it out. I’m so glad you like my blog – hope you stay tuned! I actually *hate* the endsheets…and got a rude awakening with that. My first order was placed before they added them, and I loved the book. I got it printed a second time (only a few weeks later), and was stunned to find the endsheets – had planned my layout without them and it didn’t look good with them. I was also unimpressed with Adorama’s “Customer Service” – they didn’t offer me any kind of discount, credit, or even an apology! They said I could send the book back if I wasn’t happy. So I’m looking for a new place to have books printed, which is sad because I did like the quality of their product. Just think endsheets should be optional, and it should be clearly stated that they’ll be included if it’s not an option. I’m thrilled to report that the endpages are now *optional*! They are present by default, but you can uncheck the box to get rid of them, yay! More options are always good! Thank you so much for these detailed reviews! I am definitely in the market for a photo book for my wedding photos and I’m thrilled to find a blog that is so knowledgeable and in depth. Thank you!! Thank you for sharing excellent informations. Your website is very cool. I am impressed by the details that you have on this website. It reveals how nicely you perceive this subject. Bookmarked this website page, will come back for extra articles. You, my pal, ROCK! I found simply the information I already searched all over the place and simply couldn’t come across. What a great web-site. Thank you so much for your thorough review and experience with AdoramaPix for a quality wedding album. Even four years later, brides like me are still asking the same question on who to use! You’re welcome Kristine – glad you found it helfpul! Did you see my main wedding page with all of my wedding photo books and other wedding ideas? Just a heads up that AdoramaPix no longer ships photobooks internationally (besides Canada). I have been very satisfied with their photobooks – too bad they no longer ship overseas!